35 West 15th Street 9C, New York, NY 10011 | Sotheby's International Realty, Inc.
$5,875,000 4 Bedrooms4 Full / 1 Partial Baths2,637 sq. ft. 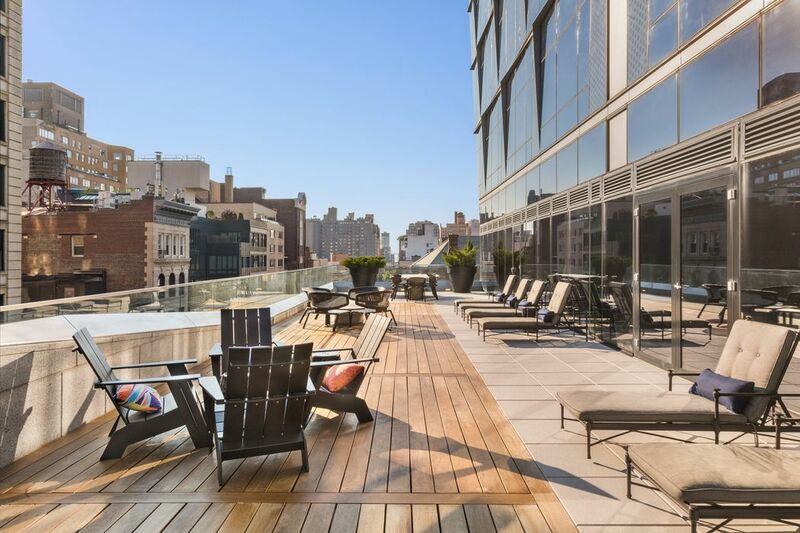 Offered for sale is a new construction four bedroom, four-and-a-half bathroom condominium at 35 West 15th Street, between 5th and 6th Avenues. With 2,636 square feet of living space and iconic Manhattan views through floor-to-ceiling windows, apartment 9C at the 35XV condominium enjoys its southern and western exposures in modern Downtown style. Entered through a large foyer with walk-in cloak room and a stylish powder room, a dramatic and spacious corner living room is waiting just around the corner. 35XV’s geometric glass curtain wall design by the architectural firm of FXFowle is on display in this uniquely panoramic and flexible living space. Located adjacent to the living room is a separate kitchen, equipped with motorized Poggenpohl cabinets in Walnut and White Lacquer, honed white marble countertops and backsplash, a suite of Miele appliances, and a Sub-Zero wine refrigerator. The kitchen is in conversation with a south-facing breakfast room, both of which can hidden away conveniently via pocket doors. A private, south-facing master suite includes two walk-in closets and a linen closet, as well as a roomy five-fixture master bathroom with radiant heat floors. 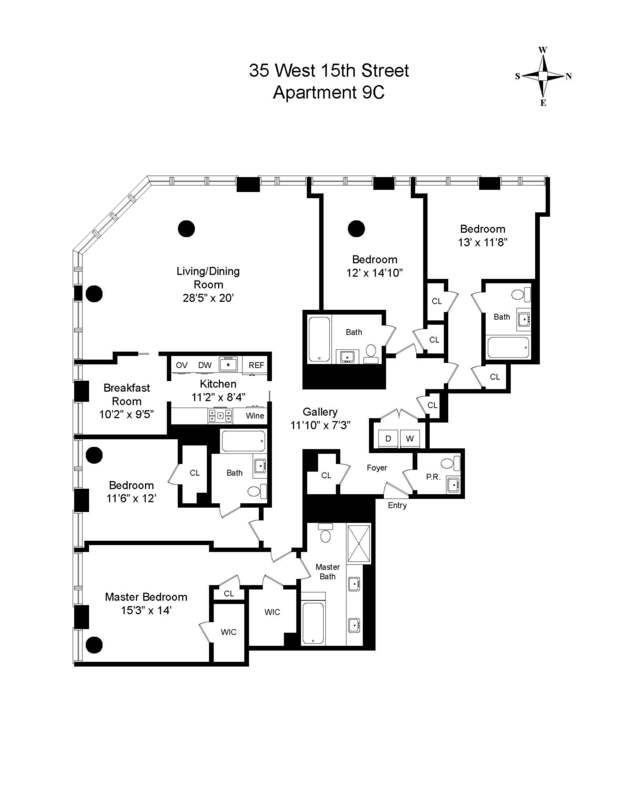 The remaining three bedrooms are all accompanied by en-suite baths and generous closet space. In addition to central air conditioning, the apartment includes other modern conveniences including motorized solar shades in the living room and master suite, vented in-unit laundry, and Lutron lighting controls throughout. 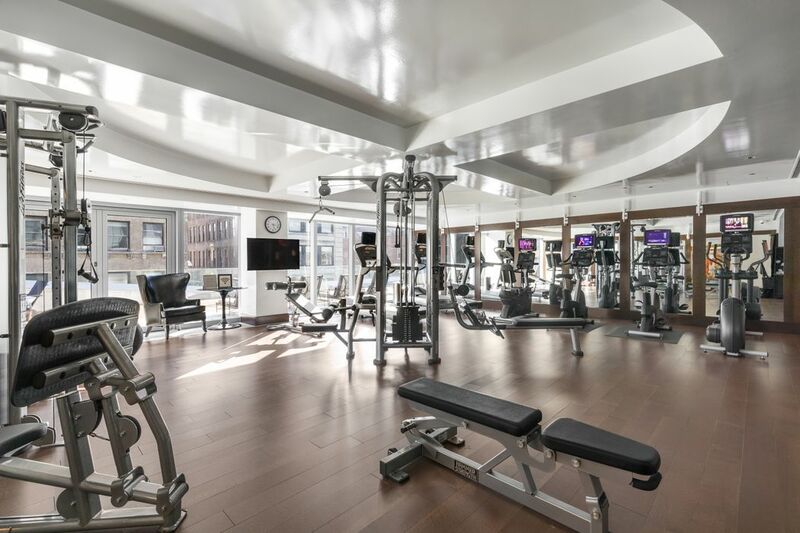 35XV has a full-time doorman, live-in resident manager, and a full suite of amenities including a common outdoor terrace, health club, wine storage for each apartment, children’s playroom, and bike storage room. Please note that buyers are responsible for a two month common charge capital contribution upon closing. Some photos have been digitally staged.